Getting found on search is a challenge. Not only are their other brands competing for the same search topics as you, but you also have to organize your content in a way that allows search engines to recognize your authority on a specific topic. To make things even more complicated, if you've been creating content for years without topic clusters in mind, grouping your content into topics can be a daunting, if not impossible task. That's where the related content search comes in. The related content search will surface any content you've already posted that relates to a topic you are creating in content strategy. This lets you quickly organize your content so search engines view you as an authority on that topic, and show your content higher up in search results. 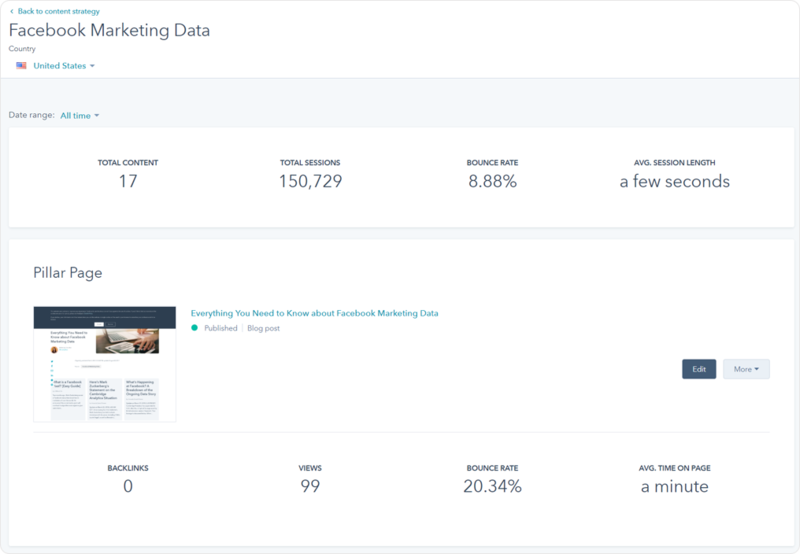 So you can track your success, we now have a content performance view within content strategy as well. This view will show you how each piece of content within your topic is performing, and contributing to your site's overall traffic. Entering content strategy, you will now have access to two tabs when viewing your topics: a “Topical Coverage” tab, and a “Content Performance” tab. The topical coverage tab will show you the web-view you are familiar with. Clicking over to the content performance tab, you will be shown the new table topics view. This view will first show you metrics such as the number of content pieces associated to the topic, total sessions, bounce rate, and average sessions length. Next, you will see the pillar page for that specific topic, as well as information regarding that page’s performance. Finally, instead of the “web” of supporting content, you’ll now see all your supporting content listed in a table. In this table, you’ll see metrics on traffic to your content, and also whether or not your piece of content is linked back to the pillar page it supports. Ready to create a new topic? Now with related content search, simply create a topic, and you’ll be presented with a list of content that you’ve already created that you can add to your topic cluster upon creation. Note that you will still need to create back links between your supporting content and your pillar pages. Right now, all accounts have access to opt-in to the tabulated view of content strategy. Opting into this view will give you access to the related content search as well.